The following is the 2019 schedule for the Quad City Steamwheelers. Quad City will enter it's second season as a franchise and makes the jump from Champions Indoor Football. 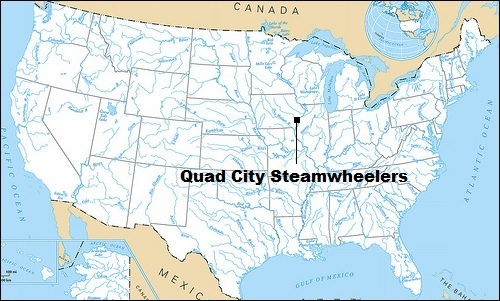 In spite having the same name of the af2 franchise that played from 2000-2009, this incarnation of the Quad City Steamwheelers is in name and logo only, with no shared history to the former franchise. They finished 8-4 in the CIF's North Conference last season, earning a playoff bid. However, they were defeated, 54-46, by the Sioux City Bandits. The Steamwheelers will look to build on their success this season in the IFL. The Steamwheelers begin their first IFL season with home dates against the expansion San Diego Strike Force and the defending IFL champion Iowa Barnstormers. They do not play more than two straight at home nor on the road in 2019. They play both Iowa teams, the Barnstormers and Cedar Rapids River Kings, twice each. They close out their season on the road against the expansion Tucson Sugar Skulls. They play each of the other nine IFL teams at least once, with the exception of the Arizona Rattlers, who do not find themselves on the Steamwheelers schedule this season. Each IFL team plays 14 games (seven home and seven away), and has three bye weeks. The Steamwheelers' byes come in Weeks 3, 8 and 15. They play their home games at TaxSlayer Center at Moline, Illinois. Cory Ross is the Steamwheelers' head coach. All Steamwheelers games will be broadcast locally on the radio and will be available for streaming through those stations. SCtoC will provide links in its previews of the games, as well as recaps of each IFL game. All IFL games are available to be streamed on video via the IFL's YouTube channel. Below is the Steamwheelers' 2019 schedule. Home games are noted in bold blue. Times and dates are subject to change. All times are pacific. Where applicable, click on the final score for the boxcore and Recap for the SCtoC original recap of the game. Week 9 -- Sat., April 20 - Tucson Sugar Skulls, 5:05 p.m.
Week 10 -- Sun., April 28 - at Bismarck Bucks, 12:05 p.m.
Week 11 -- Sat., May 4 - Sioux Falls Storm, 5:05 p.m.
Week 12 -- Sat., May 11 - at Iowa Barnstormers, 5:05 p.m.
Week 13 -- Fri., May 17 - Cedar Rapids River Kings, 5:05 p.m.
Week 14 -- Fri., May 24 - at Nebraska Danger, 5:05 p.m.
Week 16 -- Fri., June 7 - Bismarck Bucks, 5:05 p.m.
Week 17 -- Sat., June 15 - at Tucson Sugar Skulls, 6 p.m.